What The King Saw In The Box: Can You Guess? 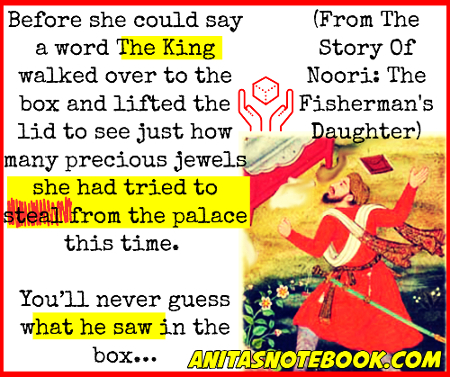 There has been a lot of interest lately in the story of Noori: The Fisherman’s Daughter Who Married A King. I am glad that people are getting into this story as it is beautiful in my eyes. The part of the Noori’s story told in the picture above is the scene where everything changes between her and her husband The King. What The King sees in the box starts a chain of events that eventually takes the two into legendary status. To this very day people will still travel great distances to pay tribute to Noori Jam Tamachi. Glad you liked the story Kiara!